This isn’t RV related, but when we travel we don’t want our garden to perish. It’s difficult enough to keep things alive in the full sun and Texas heat while we’re around, and we don’t want to inconvenience our neighbors by requesting them to come over and water our garden all the time. As you can see in the photos below, our garden already has quite a few barren spots that we need to fill in. 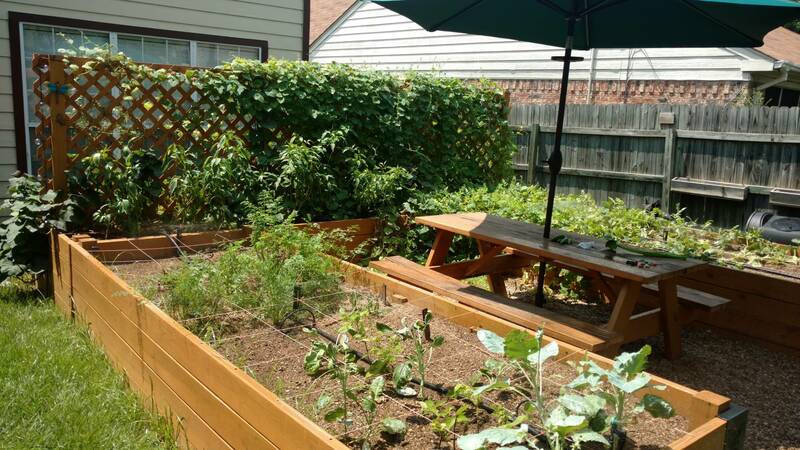 I previously setup the garden with a soaker hose staked down the middle, and an Orbit timer to turn it on and off. The problem with this is that the water didn’t reach all sides of the boxes, deteriorated quickly in the sun, and the timer eventually failed. I spoke with one of my neighbors about the timer and he said that he has started using a RV water pressure regulator on his, because his garden timers kept failing due to the water pressure in our neighborhood. For version 2.0, I picked up a Mister Landscaper kit from Amazon. The kit includes a pressure regulator and timer, so I didn’t bother buying them. However I ordered another Orbit after realizing that the timer doesn’t run on a 24 hour cycle, and is only good for setting the duration of the watering. Since I want the watering to be performed daily, that was another $30-something expense to replace the timer. However, the rest of the kit is really nice. I chose the kit because it uses 1/2″ hose instead of 1/4″ like many other kits, and has a lot more coverage. 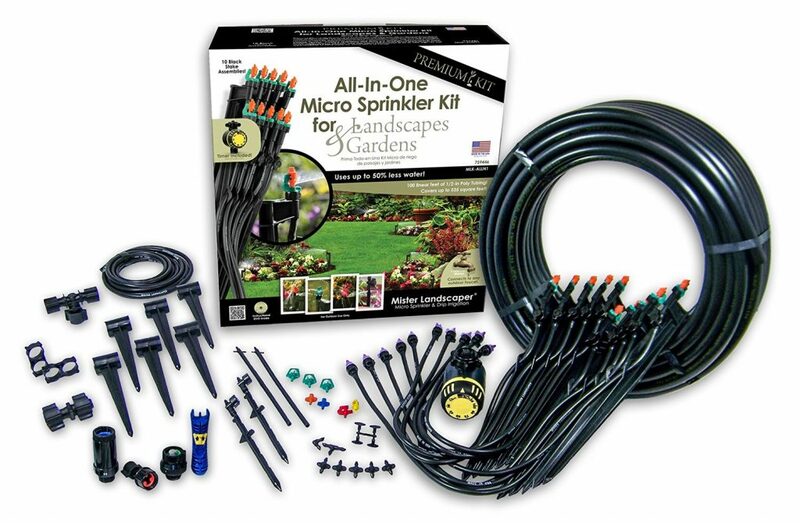 While a drip system might be arguably be better for our garden, I opted for this system because of the quick installation time and the fact that we haven’t had issues with the leaves being wet in the past. One nice thing about this system is that I can expand it in the future to use drips for certain portions of the garden, and sprayers for other sections. The install took about half an hour, from routing the 1/2″ line in a U shape around the garden to piercing the main line and tapping into it with the sprinklers, to changing the heads on them. Since taking this photo I’ve swapped out a couple more heads, and now have 100% coverage of the garden and planters surrounding it. Overall, I’m really happy with the kit. We’ll see how it holds up after a few months, but everything looks well thought out, simple, and of good quality. It does everything that it is supposed to do, and was quick to install. The timer is lacking for our needs, but does a good job for what it is intended to do. I opted to replace it with another Orbit unit, which was an unexpected cost, but together will accomplish our goal of keeping the garden watered while we are away.